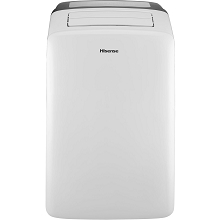 Affordable and efficient, the Hisense 70-pint dehumidifier is designed to remove 70 pints of damaging moisture per day from indoor spaces up to 1500 square feet. Three operating modes (auto dry, continuous, and manual) make this unit a versatile choice. During the dehumidification process, water accumulates in the 13.7-pint water tank or is continuously emptied into a low-level drain using a standard garden hose (hose not included). Additional features include a programmable 24-hour on/off timer, adjustable humidistat, and full-tank alert/shutoff. 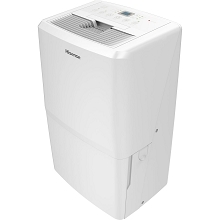 For maximum comfort with convenient flexible control, the Hisense 12,000 BTU portable air conditioner cools, dehumidifies, and also has a fan-only mode. Designed for rooms up to 400 square feet, this portable unit is easy to install with the included window kit. The I-FEEL temperature sensor built into the remote control senses its surrounding temperature, and transmits the signal back to the unit, providing maximum comfort. Smart mode automatically sets temperature and humidity based on room conditions, all at the touch of a button.